Don’t Buy Life Insurance Unless It Meets These Five Criteria! Giving you insurance for life. Providing you with guaranteed access to credit. If you’re like 67 percent of the people living in the United States, one of your top priorities is having enough money for a comfortable retirement. You need to save for retirement and with retirement age quickly approaching, you feel completely unprepared. Has saving for retirement prevented you from taking life insurance seriously? Does becoming financially independent seem impossible? As we were searching for a better way to improve our clients’ retirement strategies, we encountered the Infinite Banking Concept and we haven’t looked back since. During the stock market crash of 2008, we saw hard-working people lose most of their retirement savings just a few short years before their planned retirement. We vowed that we would protect people from the greed, corruption and irresponsibility of Wall Street banks and financial institutions. It occurred to us that “conventional financial wisdom” was based on faulty premises and a shift was in order. We realized that the only way to control your financial future is to control the banking function yourself. 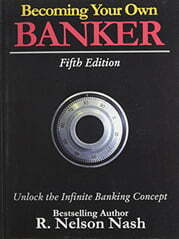 The Infinite Banking Concept is implemented through a properly-designed dividend-paying whole life insurance. This type of life insurance has INCREASED in value during every single market crash and in every period of economic boom and bust for almost 200 years. Every whole life insurance policy receives a guaranteed and predictable cash value increase (interest) every year. A properly-designed banking policy, turbo-charges the cash value and increases the death benefit higher than a traditionally-designed policy. This type of plan, that maybe just one in 1,000 financial advisors understands, makes your money in the policy, thus your retirement savings, grow significantly faster than in a traditional whole life insurance policy. Pay for a college education for you, your children and your grandchildren. Provide credit for homes, cars, businesses and investment opportunities. Save much needed retirement money. Save nearly 65% of your disposable income. An Infinite Banking policy provides you an amazingly simple, guaranteed way to become debt free! We will personally help you discover how you can stop throwing away up to 65% of your disposable income and sleep soundly knowing you won’t lose your retirement savings when the stock market crashes again. That’s right, it is 100% RISK FREE guaranteed. Have stock market losses drained your IRA or 401-K plan? Have your healthcare costs risen? Have you suffered real estate loses? Have your credit card debts risen? Is your retirement savings lower than necessary to retire at 65? Sleep soundly without worrying about the economy eating away at your nest egg. Enjoy guaranteed tax-free retirement income. Finance college education, cars, weddings, vacations, business expenses and investment opportunities. Stop worrying about stock market losses devouring your IRA or 401-K plan. Eighty percent of people research life insurance over the Internet. Let’s take it one step further by picking up the phone and calling our office toll-free at (844) 443-8422 right now for an absolutely hassle-free consultation. You’ll never reach a high-pressure salesperson. We have undergone hundreds of hours of training and ongoing education on the technical aspects that make these little-known special insurance policies such powerful financial tools. A substantial amount of training focuses on how Infinite Banking Concept Authorized Practitioners can coach their clients through the years to become their own source of financing – ultimately for their entire lifetime. We take great pride in our ability to explain complex concepts in simple terms allowing us to educate, coach and serve a diverse clientele including families, business owners, professionals and high-net-worth individuals throughout the United States. Empowering them to eliminate outside financing, reducing taxes and increasing their wealth. In other words, becoming financially independent.